The Karbonn Smart Tablet 1 is a Android 4.0.3 (Ice Cream Sandwich) operating system that runs on the 1.2 GHz X-Burst processor.It has 7-inch capacitive 5-point touch screen The Smart Tablet 1 has 2 megapixel front facing camera. 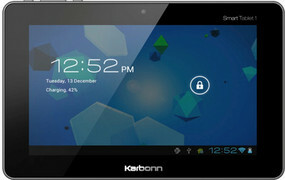 The Karbonn Smart Tablet1 comes with 7 Inch LCD Capacitive touch screen with display of 480 x 800 pixel resolution. It comes with the ports like HDMI mini, USB, 3.5 mm jack, microSD and charging port on the left side. Powered by 3700 mAh battery, the Karbonn Smart Tablet 1 offers an uninterrupted browsing time of up to 7 hours, music playtime of up to 25 hours and video playtime of 8 hours. The tab comes with 1 GB internal memory which can be expanded up to 32 GB using microSD and microSDHC cards.